We have reviewed some of manufacturing highlights in the city's industrial history such as leather, jewelry, apparel, machinery, metals, paint and varnish. But still we have only touched a handful of the hundreds, if not thousands, of companies that created a product that bore the stamp 'Made in Newark, New Jersey.' Today let's look at some of the companies that added to the diversity of Mother Newark's industrial cornucopia. Originally Pittsburgh-based, George Westinghouse was important in the railroad business but switched his attention to the electrical lamp lighting field in the 1880s. He brought the concept of AC, or alternating current, to America. Next, he had to develop a way to regulate alternating current, so he went into manufacturing electrical measurement devices. Westinghouse's early and bitter battle with Thomas Edison and the acquisition of Edward Weston's bankrupt U.S. Electrical Co. firmly established him as master of the American lighting industry. While Westinghouse eventually built more than a dozen major facilities in the nation, his Newark operation was clearly one of his most important. Begun as a small factory at Orange and Plane streets (University Avenue), it soon expanded into a two-block site referred to as the 'works.' Eventually it encompassed more than 80 separate buildings linked by a series of four-story connecting exterior walls that included more than 300,000 square feet. Westinghouse purchased the Newark property in 1899. Major renovations took place in 1904, 1911, and again in the mid-1950s. In addition to producing lighting and electrical measuring devices, the plant was used for the making of auto ignition devices and household appliances such as heaters, toasters, irons and radios. Later, the company concentrated on meters, relays and electrical measuring devices. Gears and pinions and switchboard motors were produced for radio broadcasting and even for ships at sea. Some famous firsts occurred at the factory, including the production of the first motors for electric fans. It also was a center for the production of magnetic tapes and home to the pioneering radio station WJZ, which in 1921 'sent the first big sporting event over the air.' The station also broadcast the 1921 World Series and the subsequent Dempsey-Carpentier fight, what sportswriters called 'the first big prize fight thus sent.' In 1929, nearly 3,000 employees, mostly highly skilled women, made up the work force. After the Depression it was greatly reduced. By the 1970s the last of the Westinghouse workers were sent packing as the company's new Florida facility opened to lower operating costs. We may imagine that a company is unlikely to exist longer than 100 years. In its 80 years in Newark, Westinghouse chalked up some impressive achievements, producing arc lighting, household appliances and electrical measurements. In addition to manufacturing radios and playing a key role in the broadcasting industry, its officials also were supposedly involved in secret wartime activities. Paradoxically, as the Westinghouse 'works' were being adapted for a new life in the 1950s, a decision to close the place was being made in Pittsburgh. In spite of the frantic efforts of local officials to retain the company and its extensive work force, company officials decided to close. Briefly, the building was used by New Jersey Transit. Today it serves as a warehouse. What a great site next to a major commuter line for mixed housing and commercial purposes! Ever wonder what that huge block-long concrete building along Edison Place between Mulberry Street and McCarter Highway is? Well, it's not a skyscraper tilted over on its side. It's a 91-year-old building that has been a warehouse, and has served a variety of activities of the Jersey Central Railroad. Over the years, it's been a site for light manufacturing, a trucking terminal, an office center for several companies, including a trucking firm and an appliance distributor, and a printing plant. The building was designed to hold the weight of a fully loaded railroad train. Because of its massive size, it served for a time as a civil defense center. At one time a proposal was made to use it as a giant multi-storied car park for a luxury hotel that was never built. We can share several facts about the builder and the site. We know that it was built by John W. Ferguson, a Paterson, N.J., contractor and civil engineer who headed one of the largest construction companies in the East. According to one report, his firm 'constructed many large buildings…, handling work for the government, Wright Aeronautical Corporation, the Pennsylvania Railroad and other important clients.' Other New Jersey buildings he was responsible for included the New Jersey State Armory, Paterson's Hamilton Trust Co., the United Bank and the Colt Building. He also built the Hackensack Trust Co., Botany Mills of Passaic, the DeLaval plant in Trenton and many buildings at Camp Dix. The Edison site is a seven-story reinforced concrete building that occupies 362 feet along Edison Place and 128 feet along McCarter Highway. The framing of the building is divided into 15 bays. The main entrance faces Edison Place, where elements of a classicized cornice run along the top of the structure. The warehouse has been described as Renaissance Revival. The upper top floors have equally spaced small square windows. A wide projecting course separates the upper three floors from the lower four floors. According to the previously mentioned report, 'The building provides an early example of the use of sparse ornamentation on a concrete structure. The architecture is deliberately reminiscent of an urban Renaissance palace and is a unique example in Newark.' Just as the Newark Basilica of the Sacred Heart is a sacred space, the Newark Warehouse should be considered, because of its enormous interior, as a cathedral to commerce, transportation and industry. Just as the kitchen table served as a birthplace for the hand-rolled cigar and plastic, it also aided the development of the fountain pen. Lewis E. Waterman, born in New York in 1837, was an insurance salesman who used early pens in his business. When he lost an important policy due to a faulty pen he was determined to remedy the situation. Thus, he invented the first thoroughly dependable pen for the commercial market. So successful was he that eventually he traded in the role of insurance salesman for pen manufacturer. Waterman's first business was located in Manhattan. 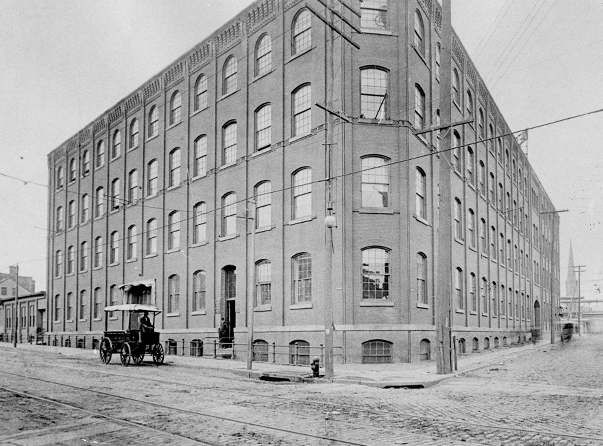 In 1920, he moved his company to 140 Thomas Street, Newark, where he opened a $1.2 million factory for the large-scale production of the new writing instrument. The success of the device was tied to the instrument's 'three fissure ink feed.' With this new pen he solved all the problems that had plagued other pen inventors. 'This new feed, by using the principle of capillary attraction, kept the flow of ink from reservoir to pen point under constant control,' one examiner said. Waterman originally called his firm the Ideal Pen Co. He later changed the name to the Waterman Co., serving it as president and general manger. Waterman was succeeded by his nephew, Frank D. Waterman. By 1934, five members of the family were working for the company. At that time there were more than 1,000 employees. The pen they developed originally was made of hard rubber. Subsequently, plastic celluloid came into general use. The pen's internal rubber sac held the ink. The tips and decoration were of gold or silver. Gold was also used in the decorative exterior. In fact, there was an entire department of the company devoted to the mountings and decorations and designs for both the Waterman pen and their elaborate desk sets. Gold supplies came from such countries as New Zealand, Tasmania, Japan and from states like Alaska, and California. Rubber was received from Peru. While the Waterman Co. was in Newark, radical changes in the writing instrument occurred, including the use of pyroxlin plastic instead of vulcanized rubber in the barrels of the pens and the use of plastic molds as opposed to the hand grinding of the pen barrels. Once the molds were used, nearly 7,000 pens could be crafted daily as opposed to approximately 400 hand-created barrels. By 1940, the Waterman Pen Co., the oldest in the nation, was sold and moved back to New York. That old give and take between Newark and New York came into play again as Mayor Fiorello La Guardia hailed the move as the beginning of a campaign to bring industry and business back to 'his city.' La Guardia was the same guy who crabbed about getting off an airline in Newark and not New York City. Sound familiar? After Waterman went back to New York, the Thomas Street factory was occupied by the largest maker of glass eyes for dolls and the nation's second largest producer of zippers.